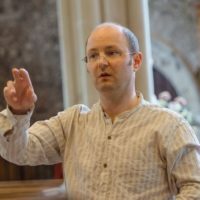 Currently Director of Music at Litchfield Cathedral, Ben Lamb’s love of choral music was kindled as a chorister at Salisbury Cathedral. This has been a key part of his life ever since. He has held organ scholarships at Truro and Salisbury Cathedrals and spent some years in the classroom, latterly as Head of Music at La Retraite Swan School in Salisbury. During this time, he founded Sarum Voices, with whom he has made a number of commercial recordings.